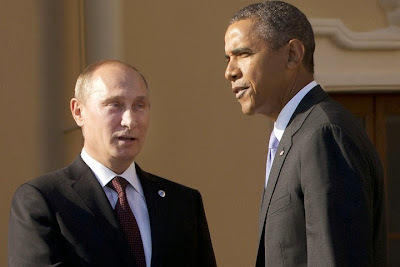 President Obama and Russian President Vladimir Putin. Word of this stirring success has yet to reach the Kremlin. While President Obama praised his mastery, Russia’s troops and associated thugs were pressing ahead with the on-and-off invasion of Eastern Ukraine that has seized roughly another 200 square miles of territory the last few months. The latest Russian offensive has dispensed with the pretense of supporting an indigenous uprising by ethnic Russians and become an even more naked land grab. We believe in the power of 21st-century international norms. Moscow excels at violating international agreements. It’s breaking its commitments as a party to the 1994 Budapest Memorandum on Security Assurances for Ukraine. And it has ripped up last September’s Minsk agreement for a Ukrainian cease-fire. To lend a symbolic poignancy to the end of the Minsk agreement, pro-Russian forces shelled the city hall in the Ukrainian town of Debaltseve that had served as the cease-fire control center under the Minsk agreement. Give them credit, Putin’s minions leaven their murderous disregard for civilian life with a perverse sense of humor. The latest Russian offensive has exposed the moral and strategic bankruptcy of the Obama administration’s opposition to providing arms to the Ukrainian government. While Russia rolls its T-80 and T-72 tanks — with at least 1,000 Russian personnel in support — we have countered with night-vision goggles and first-aid kits. Besides that, it’s a fair fight. The Obama policy reflects the craven logic that says helping a victim defend itself from an ­aggressor is dangerously provocative. Will Putin use our military support to argue that Ukraine is a puppet of the West? Of course he will, but he’ll say that regardless. Will it lead to further aggression? For a year now, Putin has waged an entirely unprovoked war of territorial aggrandizement that has steadily grown more brazen. If hanging Ukraine out to dry was supposed to de-escalate the crisis, it clearly hasn’t worked. In conflicts in the Middle East, it can be difficult for us to find allied forces that are both willing to fight and broadly share our values. This isn’t an issue in Ukraine. The Ukrainian government wants to defend its territory and had some success at it last August, before regular Russian military units entered the fight. It is a democratically elected government that is determined to make itself part of the West and is getting dismembered for the offense of replacing a Putin-style kleptocrat. As journalist Chrystia Freeland writes in the magazine The Prospect, Putin’s initial design for his own rule in Russia was an authoritarian government that relied on economic growth for its legitimacy. But he eventually realized that nationalism was a more sure foundation. In the Ukrainian conflict, he has chosen nationalistic glory — such as it is — over his country’s own economic interests in the face of Western sanctions. There is no appeasing Putin. Frankly, there is no directly stopping him, either. It is only possible to raise the costs to him of his war, including the military costs. If we won’t provide military materiel to Ukraine now, we deserve the contempt with which Putin regards us.